(NaturalNews) You probably already know that it's possible to regrow certain foods, such as potatoes or carrots, from leftover scraps of those very foods. However, you might not realize just how many other fruits and vegetables you can easily plant and harvest, saving yourself a considerable amount of money over time while having fun in the process. Some of these foods are seemingly "exotic" ones that you may be surprised to learn can be grown in almost any climate. For example, did you know that you can grow your own pineapples and avocados? Here is a short list of foods you can regrow from the same food you ate to begin with. You'll discover how easy it is while learning about some you might not have realized were possible to grow in the first place. One of the easier vegetables to grow, green onions from the market can be replanted by simply cutting off the green part and replanting the bulb. An even simpler method is to just place bulbs that have a couple of inches of the green stem remaining into a jar of water, then resting on a window sill. Ginger can be fairly expensive in some supermarkets, but it can be grown at home with little hassle. Just take a chunk of ginger and place it in potting soil with the bud facing up. Within a few weeks you'll see new shoots which means they can be pulled up. You can harvest your homegrown ginger and start the cycle again. Avocados are another relatively expensive item, but they can be regrown without too much trouble. First, wash the seed and use toothpicks to rest it in a jar so it's over the water. About an inch of the seed should be submerged in the water. Place the jar in a warm place with indirect sunlight and make sure the water level doesn't drop below the seed. It may take up to six weeks before roots and a stem appear. Once the stem grows to about six inches, cut it back to three inches. Once leaves appear, plant the seed in soil, leaving the top half of the seed exposed. It's possible to grow pineapples at home, even if you don't live in a tropical climate. To do it successfully can be a little tricky and requires patience (it may take up to two years for your plant to produce fruit), but it's definitely worth trying. First, twist off the top set of leaves so part of the stalk comes out as well. Trim the bottom bunches of leaves, leaving about an inch of the base exposed, then let it dry for two days. Next, place it in water, being sure to change out the water every few days and to keep it away from extreme heat or cold. After three weeks, roots should form; this completes the crown rooting process. It's now time to plant this in quality, well-draining soil. Within two months, it should become secured in the soil and strong enough to support itself as its own plant. After one year, repot. Soon thereafter, you may notice blue flowers appearing which eventually dry up. This is an indication that the plant is in the process of producing fruit and becoming ripe. For more details, including how to force the flowering process, refer to this step-by-step guide. Garlic is healthy, flavorful and very easy to grow at home. Simply take one clove and plant it in potting soil, with the root facing down. Be sure to cut the shoots back once they appear as that will produce a bulb. Garlic likes plenty of direct sunlight, so it's best to keep it in sunny areas as much as possible. To grow peppers, just take a few seeds from your favorite fresh hot peppers and plant them in potting soil. Keep them in direct sunlight or plant them outdoors in warm weather. Cilantro is a common ingredient in Mexican cuisine that's often used in guacamole or as a taco topping. To regrow cilantro, just take the bottom of some stems and place them in a glass of water until the roots grow about two inches long. Then plant them in potting soil. It only takes a few weeks before the new leaves appear. 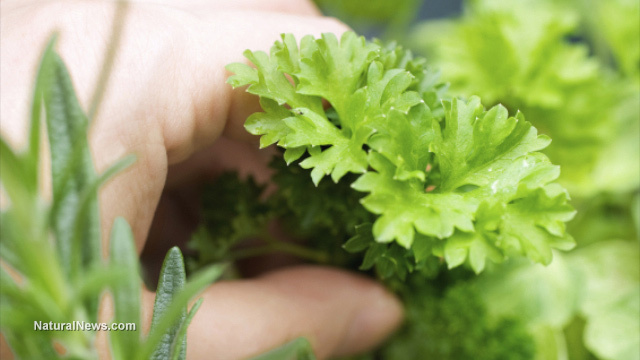 These are just a few of the foods that can be regrown at home. Why not give it a try? There's nothing more satisfying than eating fruits and veggies you've grown yourself (organically, of course). It's also a fun and educational project for children.